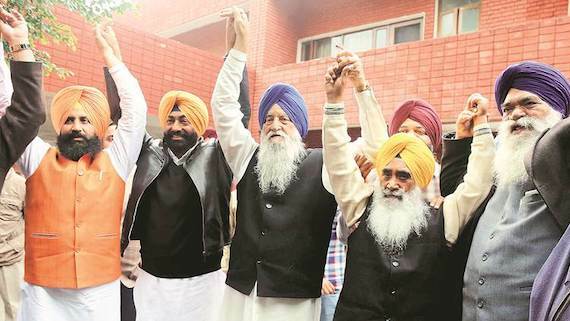 Chandigarh: Shiromani Akali Dal (Taksali), the break away faction of Shiromani Akali Dal (Badal), has resumed talks with the Punjab Democratic Alliance, a poll alliance of six parties- including a faction of AAP rebels led by Bhulath MLA Sukhpal Singh Khaira and another such faction led by Patiala MP Dr. Dharamvira Gandhi, besides the Lok Insaaf Party of Bains Brothers, the BSP and two left parties. SAD (T) had talked to PDA earlier also but they had failed to forge the agreement after which SAD (T) had initiated talks with AAP. As both SAD (T) and AAP had announced their candidates for Anandpur Sahib Lok Sabha seat, neither party was willing to withdraw its candidate; as a result the talks fell flat. Interestingly, the reason behind failure of earlier talks between SAD (T) and PDA was also the Anandpur Sahib seat. SAD (T) has fielded ex-Congress man Bir Davinder Singh from this seat while the PDA was asking it to leave the seat for Bahujan Samaj Party (BSP) that has fielded Vikmram Singh Sodhi from this seat. This time the SAD (T) is hoping to bargain Anandpur Sahib seat with PDA in exchange of Khadoor Sahib Lok Sabha seat from where PDA candidate Paramjeet Kaur Khalra is contesting the election on Sukhpal Khaira led Punjabi Ekta Party (PEP) ticket. SAD (T) has fielded ex-SAD (B) man and former chief of Indian Army Gen. J. J. Singh from this seat. The proposal is that if PDA and the BSP agrees to withdraw their candidate from Anandpur Sahib seat in favour of SAD (T) candidate Bir Davinder Singh then in exchange SAD (T) would withdraw its candidate from Khadoor Sahib constituency in favour of Paramjeet Kaur Khalra. As per The Tribune (TT): “Sewa Singh Sekhwan from the SAD (T) said the offer to withdraw the candidature of Gen JJ Singh (retd) was “under consideration”. Sukhpal Singh Khaira of the PEP, too, confirmed that he had appealed to the Taksalis that in the larger interest of Punjab they should throw their weight behind Paramjit Kaur Khalra, who stood a good chance of winning the polls”.